Let me say up front that my own experience makes me much more inclined to worry about inflation. I have first-hand experience with the harm of inflation: the 14 percent inflation of 1980-1981 devastated my very first budget. Deflation, on the other hand, has always been a purely theoretical problem, and one that doesn't even sound all that bad. Falling prices? What's not to like? So, here's the first thing: Deflation isn't falling prices. Just as inflation is the money becoming less valuable, deflation is the money becoming more valuable. Prices tend to fall during a period of deflation, but prices change for lots of reasons, and other factors can easily cause some prices to rise, even during deflation. For example, widespread drought could easily cause food prices to rise during deflation. Just as inflation is caused by an increase in the money supply, deflation is caused by a decrease in the money supply — but it's not quite that simple. The "money supply" isn't one single thing. Anything that you can spend is money, so that's not just cash and checking accounts and money fund balances. For example, the available credit in your Home Equity Line of Credit (if the collapse in housing prices has left you with any) is pretty close to being money, as is the available credit on your credit cards. Even the value of your brokerage account is practically money — you could sell your stocks and have the cash in four or five days. The supply of those sorts of money collapsed during the panic at the beginning of the crisis, as credit lines were cut and asset values crashed. The effective supply of money fell even further, because people quit spending — and money that people won't spend has little effect on prices. 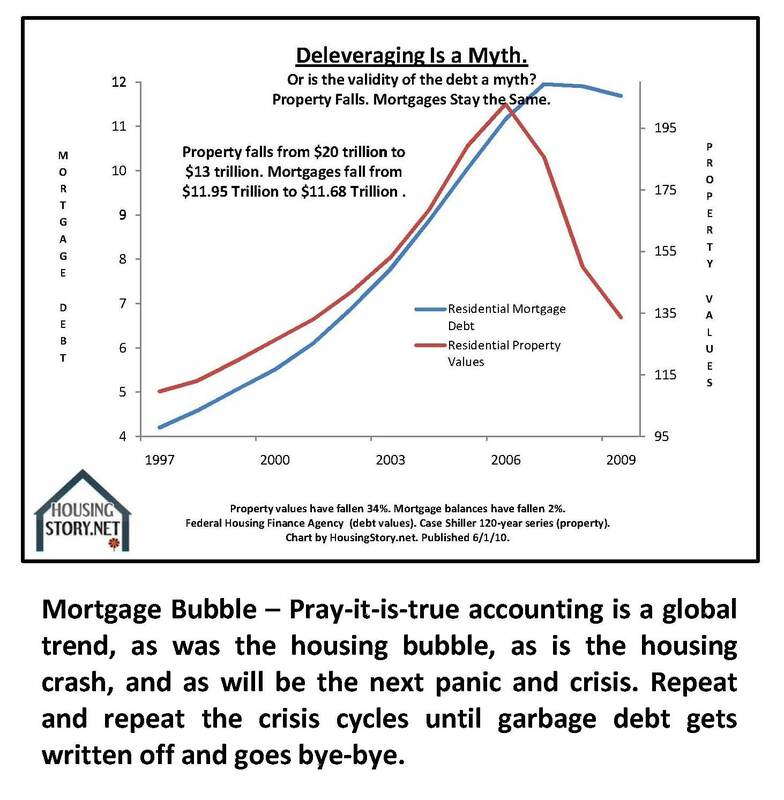 The Federal Reserve stood against this collapse in the money supply by creating bank reserves and by buying assets (putting cash in the hands of whoever was selling — mainly the Treasury and the government agencies that support the mortgage market). Most people (including me) saw that surge in bank reserves and money and assumed that inflation was right around the corner. It's now pretty clear that the Fed was right and I was wrong. All that money just barely managed to stave off deflation. Falling prices doesn't sound so awful, but remember that falling prices are just a symptom. When the money unexpectedly becomes more valuable, the result is pain for anybody who has to come up with cash now to satisfy a deal where the price was set earlier — your rent, your cell phone contract, your health insurance all cost more than you thought they were going to when you signed the contract. To make matters worse (and more complicated), some prices are less prone to changing than others. In particular, wages are generally sticky on the downside. That means that rather than a smooth adjustment with wage cuts, deflation tends to produce high unemployment. The real place that deflation bites, though, is debt. Just as inflation makes winners out of people who borrowed money at low, fixed rates, deflation makes them losers, crushing their households under the burden of paying off old debts with money whose value rises further and further above what they borrowed. In a society where many people have debts, the pain is spread far and wide. Of course deflation has winners as well as losers, at least on the surface. Anyone with cash tends to benefit as their money becomes more valuable. Anyone with long-term bonds at fixed rates can do spectacularly well. Anyone with a secure job and little or no debt has a good shot at doing just fine. In the real world, things aren't quite so happy. Those long-term bonds are especially likely to default; even the most secure jobs can be lost during a time of deflation. Even cash hasn't been a perfect safe haven historically, although our bank deposit insurance has held up OK so far. The one good thing about deflation as a risk is that the steps to protect yourself are the same practical steps that we often talk about here on Wise Bread: reduce fixed expenses, avoid debt, boost your emergency fund. It makes more sense than ever to delay purchases, and since your money is getting more valuable, holding cash is a winning proposition. As deflation starts to bite, more and more households start to follow this advice: They avoid debt, they reduce spending, they hoard cash. Because of that, besides hurting everyone with debts and making it tougher to find and keep jobs, deflation hurts the whole economy. This effect can snowball, producing a recession that's just about impossible to escape from — see the experience of the US in the 1930s. And that's what makes the current situation so risky: That consensus seems to have broken down. It's by no means clear that the Fed would repeat purchases on that scale. The upshot is that deflation, and all the pain it brings, is once again a real risk. I give you a lot of credit, Phillip. This is one of the better articles I have read about deflation. I was excited to see you that mention that prices are only a symptom of inflation/deflation, and that the true definition, at least according to Austrian economists, is the rise or fall in money supply AND credit. Kudos on that! While it may seem like deflation will lead to an all-on collapse of just about everything, that is very rarely the case. Rather, it is simply the correction of the excess leverage in the system. Yes, there will be pain, and it will not be easy for many. The more debt people have, the more it is going to hurt. But it is a necessary correction and we cannot get out of this depression until the debt is either paid down or defaulted upon. If you know deflation is a real possibility, you manage your finances in a particular way. In particular, you avoid debt and you're very careful about long-term, fixed-price contracts. Since we left the gold standard, though, we haven't had any offsetting deflations. After three or four generations, I think people can be excused for arranging their finances without proper care for the possibility of deflation. Great article and comment. I agree that just like many issues, addressing the symptoms does nothing. We need to resolve the problems. It is sometimes scary how much debt is owed on the public and private level. I know there are debtophiles (just made that up - all rights reserved...) who think that we need "good debt" to grow. I get it. I won't scream at some debt - controlled, conservative debt. But debts to finance lifestyles seem bound to cause more destruction than good. Debt isn't essential for growth, but growth can be a lot faster with debt. If each business has to finance its own growth entirely out of profits, growth is going to be very slow. Hi Phil - I very much enjoyed your write up. I'm surprised more people haven't discussed the possibility of deflation. I wrote my quick blurb on why Deflation Is Out Of The Question before finding this article, and have included it in my Katana wrap. In particular, wages are generally sticky on the downside. That means that rather than a smooth adjustment with wage cuts, deflation tends to produce high unemployment. Furthermore, its all about having boat loads of cash!